Spring and Winter 2019 Class Descriptions below. "A Gift of Honeybees is a Gift of Life"
We can mail you a beautiful, personalized gift certificate to give to someone. or I can email a digital one at no extra cost. 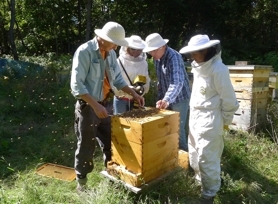 This is a hands-on workshop, ideal for beekeepers to gain confidence in working with a hive. Learn how to interact with your hive and understand what you are looking at. It is important to recognize healthy brood patterns, as well as signs of problems. 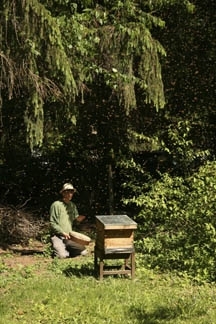 Gain a sense of the rhythms of the hive, watching and preparing for swarm season, and a general overview of hives during the main nectar flow. We will also touch on monitoring for diseases and pests, and discuss various mite treatments and timing. Chris Harp will guide you through the inspection process so you can gain confidence working with hives. Please note: Not all classes will take place, and others will fill quickly, depending on enrollment. Pre-registration required, and pre-payment requested to hold a spot in these small classes. 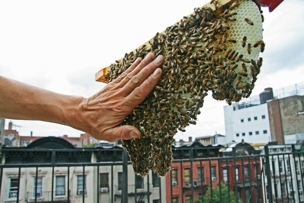 Learn about the lives of Honeybees. Hear about the current plight of Honeybee colonies, and understand the intrinsic value of nurturing these amazing creatures. For the general public, gardeners, and wanna-beekeepers. 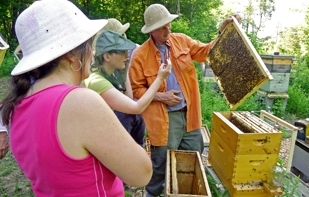 Includes a visit into a working hive to experience the honeybee community, and a honey tasting. that take place in Brooklyn and New Paltz (in the Hudson Valley). as well as informational classes for the general public and kids. You can download a list of our seasonal classes below. Thank you for your interest in HoneybeeLives.